Plenty of excitement in the last minute of the Governor’s/Rivers game. James Gomes defends Kyle Reardon. 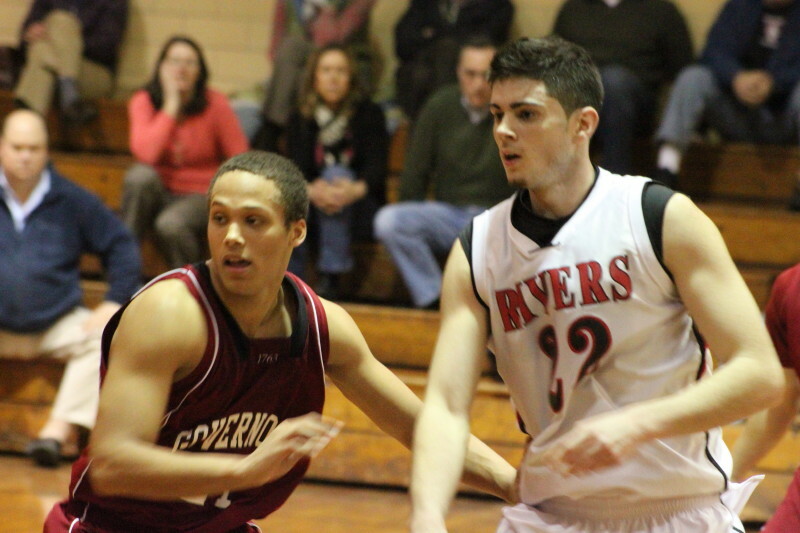 (Byfield) Governor’s Academy shot poorly and lost to Rivers School (Weston), 64-57, on Monday night in ISL action. The final seven-point margin suggests a close game but a lot of that “closeness” was a result of Rivers’ coach Andrew Mirken pulling all of his starters at once with a 61-42 lead with 1 ½ minutes left. Let’s just say that there was a significant dropoff in playing ability and the Gov starters swarmed the newbies relentlessly wracking up fifteen points in the frenzy that was the end of the game. However, that nineteen point margin was more than they could overcome. The Govs (5-8) started hot (making four of their first five shots) and led 9-4 early. After that, the looks were there but the consistent accuracy wasn’t. That poor shooting led to a couple of ten-point runs by the Red Wings. The first run featured a two-handed dunk by Nick Lund on an inbounds play and ended with the Red Wings leading, 20-13, with 7 ½ to play. 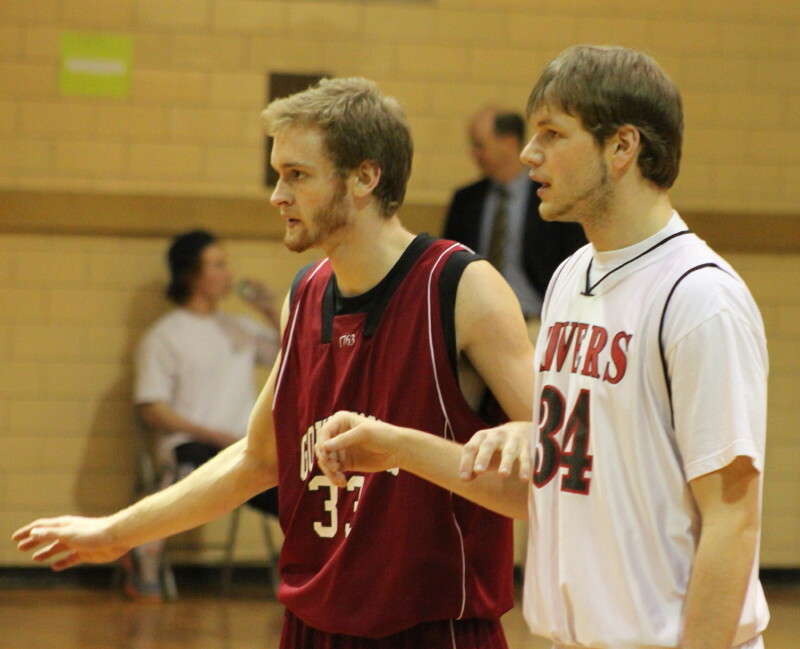 The second run had Kyle Reardon nailing his third 3 of the half and dart-like Carlin Haymon drawing six free throws. Rivers (9-7) led at the half, 35-21. Playing at home, the Govs started fast (again) in the second half with the first eight points to close to 35-29. A steal and layin by Carlin Haymon ended the run but the Govs were still around 39-35 with ten minutes left. A Rivers timeout was followed by a 9-1 Red Wing stretch over two minutes. 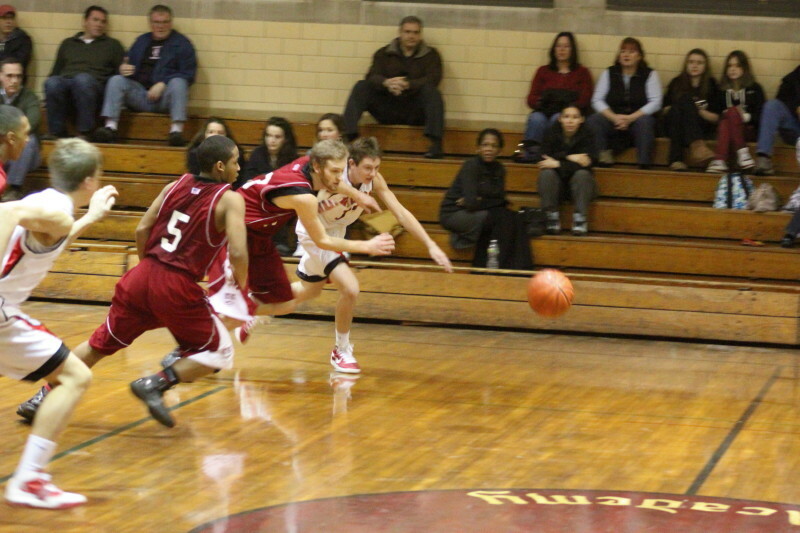 Kyle Reardon had two more 3’s in this segment which put Rivers in front, 48-36, with 7:50 to go. That cold shooting I referenced before kicked in big-time over the next six minutes. The Govs could manage just two free throws and two layups while Rivers built their lead to a seemingly comfortable, 61-42, before the end game scramble began. 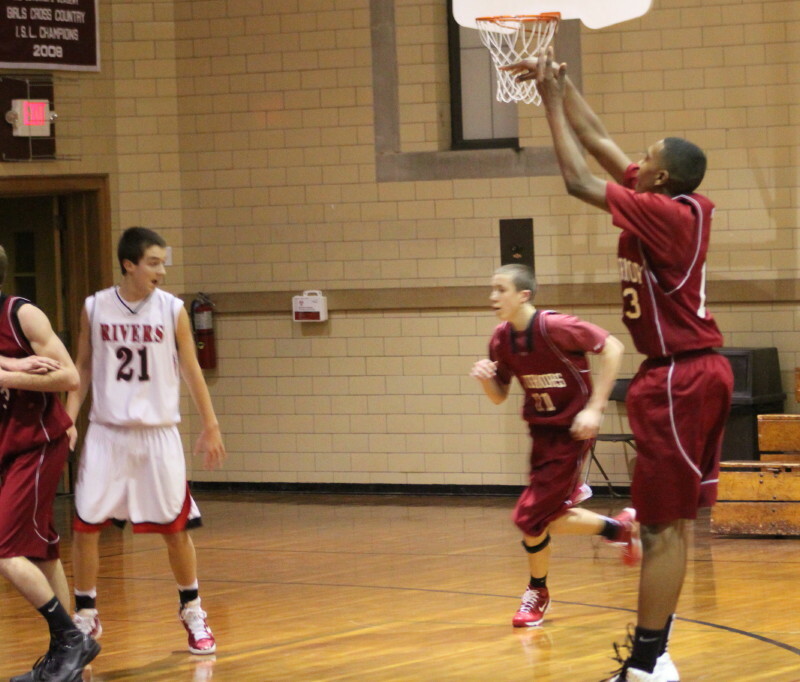 Freshman Carlin Haymon – Drew fouls and scored 17 points. Freshman Carlin Haymon and junior Kyle Reardon led all scorers with seventeen each. Carlin slashed against any defense he saw while Kyle shot over any defense he saw. 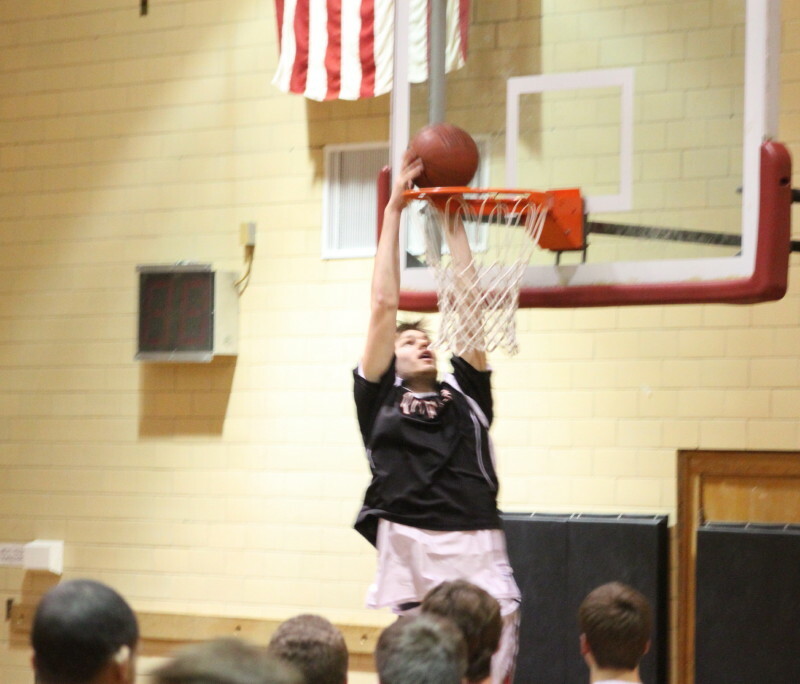 Junior Nick Lund ended with thirteen points, several blocks, and plenty of rebounds. I’m guessing that the junior is at least 6’7”. He earned plenty of attention from the Gov’s defense. I did get a shot of one of his pregame dunks. James Gomes topped the Gov’s with fifteen followed by Frank Barba (14) and Stephen Basden (12). 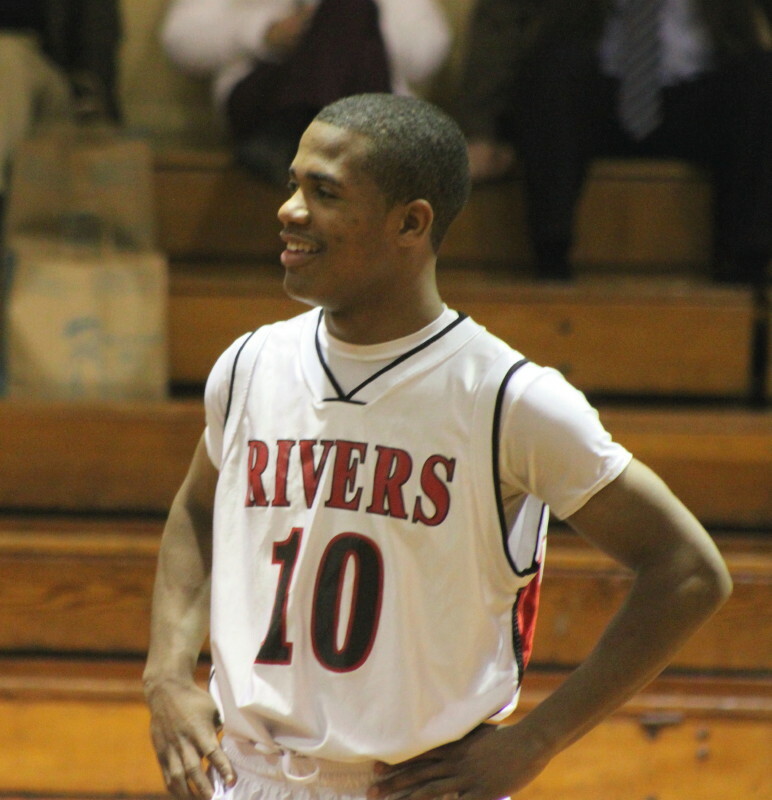 Last time at GA I saw them lose to Lawrence Academy getting few good looks and very few second chances. Not so against Rivers. GA had sixteen more shots than Rivers did. However, they ended up missing 41 shots from the outside (22-for-63) and 10 from the foul line (10-for-20). Their usually effective long-range game slumped to 2-for-12. The game was not without its adventures. (1)It didn’t start on time (5:15PM). I figured that out when the Rivers bus arrived when I did at 4:55PM. (2)The 35-second clock wasn’t working so attempts were made to fix the clock before hand to no avail. So a system was set up so that the referees would be alerted to when the time was getting close. All that planning was unnecessary as there never was a situation where the 35-second clock would have been a factor. (3)Rivers had a player who wasn’t listed in the scorebook. It might not have made a difference except he got called for a foul. That recognition earned Rivers a technical and added to the excitement in the end game scramble I described earlier.